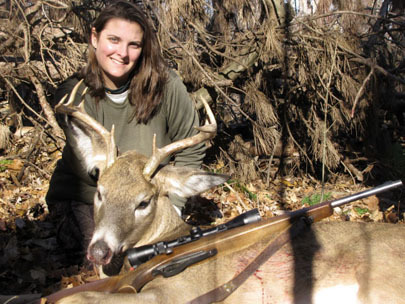 The 2011 regular deer and bear hunting seasons opened at sunrise on Saturday, November 19, in New York’s Southern Zone. The two big game seasons close at sunset on Sunday, December 11. The Southern Zone regular deer season is New York’s most popular hunting season, with participation from about 85 percent of New York’s 560,000 licensed deer hunters. Harvest during this season accounts for nearly 60 percent of the total statewide deer harvest. The remainder occurs in the Northern Zone, on Long Island and during special seasons when only archery or muzzleloading firearms may be used. Megan Myers is part of that tiny minority of females that hunt large white tailed deer, which she did while expecting this coming May. This 9-point buck was harvested by Megan in Rensselaer County at approximately 8 am on Saturday morning, the first day of rifle season. Photo provided by her proud husband, Zach Myers. Following the regular deer and bear seasons in the Southern Zone, late bowhunting and muzzleloading seasons will open at sunrise on Monday, December 12, and close at sunset on Tuesday, December 20. Hunters taking part in these special seasons must possess either bowhunting or muzzleloading privileges. Bear hunting has been expanded in eastern New York to now include the counties east of the Hudson River from Westchester County north to Washington County and is open during the same time periods as deer hunting. Successful bear hunters are asked to submit a tooth of their bear so DEC can age the bear and monitor bear population dynamics. See the bear tooth collection website for instructions at www.dec.ny.gov/outdoor/45598.html. Hunters are required to report their harvest of deer and bear within seven days. Failure to report harvested deer or bear is a violation of NYS Environmental Conservation Law. Hunters may report via an online reporting system (www.dec.ny.gov/outdoor/8316.html) or by calling the toll-free automated reporting system at 1-866-GAME-RPT (1-866-426-3778). Hunters are encouraged to participate in the Venison Donation program. By filing your permits and donating your deer, you help accomplish the needed deer management and you can feed less fortunate families. For more information: www.dec.ny.gov/outdoor/8351.html. Property owners who have problems with trespassers should contact DEC’s tip line (24/7) at 1-800-847-7332. For information about posting property against trespass see www.dec.ny.gov/outdoor/8371.html. • remember to wear hunter orange.